A few weeks ago we had our first “snowfall”. Slushy white flakes fell from the sky for several hours one morning, prompting hordes of North Carolinians to run to the nearest grocery store to buy a month’s supply of milk, bread, and toilet paper. I took the white stuff as a sign from God that I should probably go ahead and start insulating the kitchen walls already. Lucky for me, Lowe’s had called several days earlier to report that the insulation that I ordered was available for pickup. 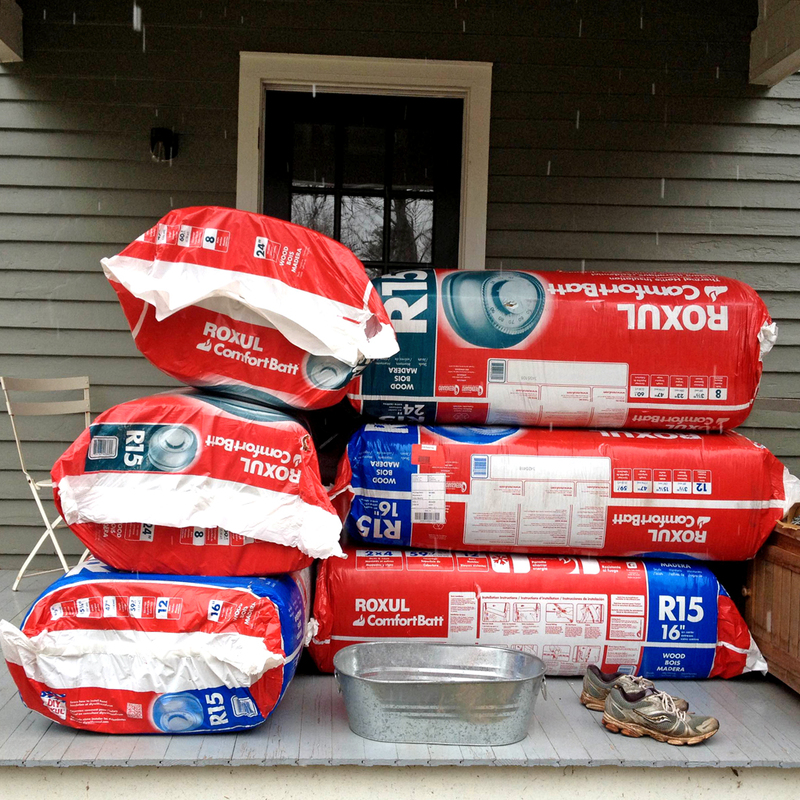 After a few trips back-and-forth to the store, the insulation was all chez Highley. So, what was so special about this insulation order? Lowe’s carries the pink stuff, right? I didn’t use the pink stuff. I used what I strongly believe is the most underrated insulation product available today: rock wool. I hate fiberglass insulation. It’s ferociously itchy, casts off clouds of glass fibers if you even look at it the wrong way, and is extremely difficult to install well. I also hate foam insulation. Mark my words, the same guys that show up on job sites in moon suits today to chip out asbestos and lead paint will still be showing up twenty years from now to remove spray foam insulation once everyone realizes it causes you to grow a third eye. Rock wool has a shape. Rock wool batts are blocks of material with a definite shape that retain their dimensions even when handled. 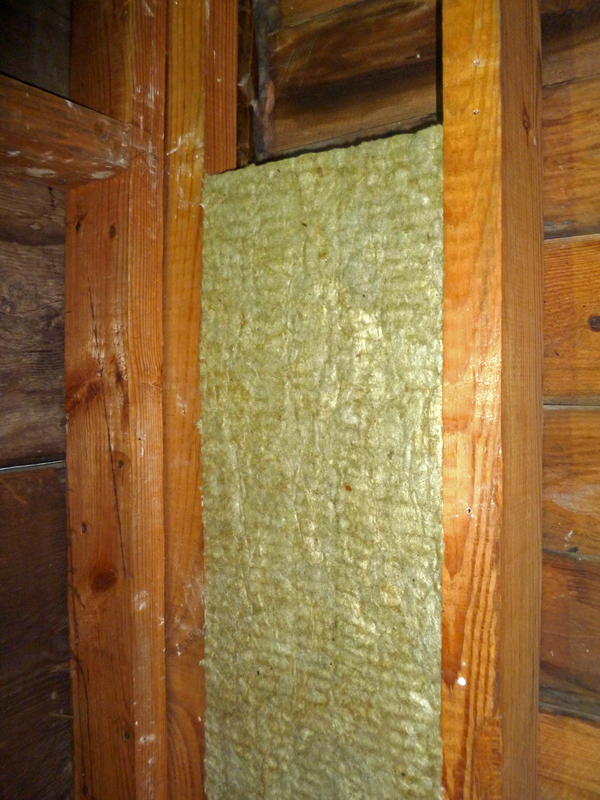 Fiberglass batts are flimsy, floppy, and amorphous and require all sorts of banjo work to keep them from sagging during installation and long after. Rock wool is lightly friction fit between studs and stays where you put it without any additional support. Rock wool is water resistant. Pour water on rock wool and it’ll puddle on top. Sure, if you turn a fire hose on it, it’ll eventually get wet, but incidental water rolls right off it. And like sheep’s wool, even when it’s wet, it still insulates. In a house without sheathing like ours, where it’s inevitable that water will occasionally work its way into the walls, this characteristic gives me peace of mind. 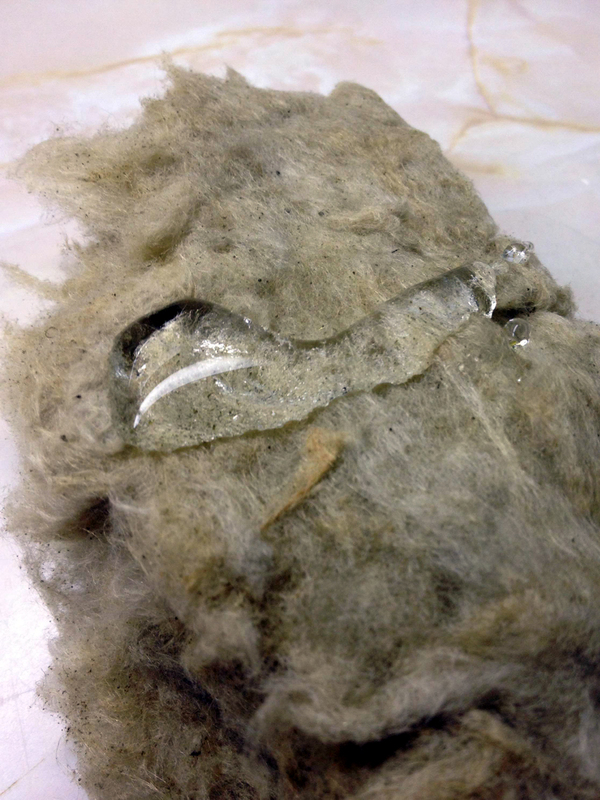 Fiberglass insulation turns into a mold farm when it gets wet and loses nearly all its insulation value. Rock wool is fire resistant. Have a gas fireplace? You know those little tufts of material that are piled below the logs to imitate glowing coals? That’s rock wool. The stuff is made of – you guessed it – rock, so it simply doesn’t burn even at temperatures that would reduce fiberglass to puddles of molten glass. I sincerely hope that we never put this characteristic to the test in our house, but there’s comfort in knowing that the insulation might at least slow down a fire, heaven forbid. Rock wool is easy to install. 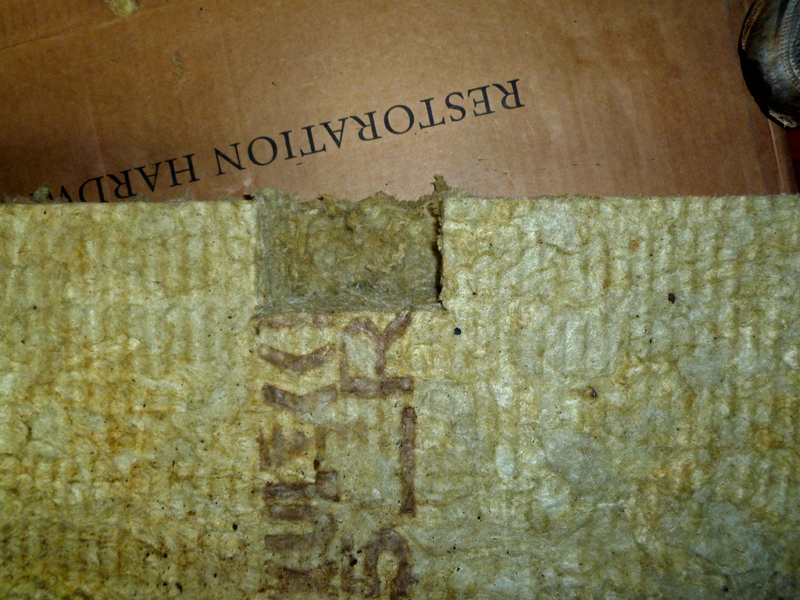 Because rock wool batts have a definite form and are somewhat stiff, you can cut them very precisely with a bread knife. When you encounter obstacles like electrical outlets, you can actually cut recesses that fit snugly around them directly into the insulation. As you can imagine, there’s not one regular stud bay in our entire house, so the ease of cutting and shaping the batts to odd configurations made a good insulation job easier to achieve. I also found rock wool to be surprisingly non-itchy; I installed it over two days in a short sleeve shirt with no gloves and experienced no discomfort. 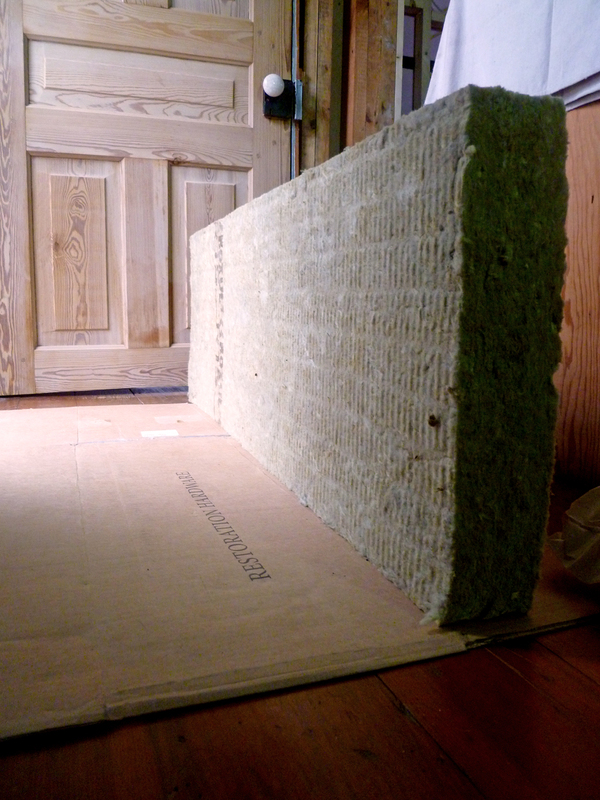 Because it’s so dense, rock wool is a very effective at acoustical isolation. The leading distributor of rock wool in the States, Roxul, markets a separate line of products solely intended for sound absorption. We installed it in the walls of the powder room that adjoins the kitchen to preclude any awkward Thanksgiving dinner moments. I noticed an immediate deadening of sound in the kitchen after the rock wool went in. The same density that makes rock wool an effective sound barrier also makes it more resistant to airflow than fiberglass batts which have a tendency to act like oversized air filters. Of course all these advantages come with a small price premium. Rock wool runs about 50% more than fiberglass insulation, but significantly less than foam, dense pack cellulose, or any of the other exotic insulation products available. For me, that’s a reasonable price to pay for what I firmly believe to be a superior product. This won’t be my last time packing the car full of the stuff.